Cheese keeps me grounded. My love of cheese (and a few other things) tethers me to the real world, in which not everything has to be ridiculously clean and healthy all the time. Sometimes you break out the cheese and other times you dive into the plant-powered, gluten-free quinoa salad. Both can exist together in my world and be deeply appreciated. When I do go towards the more indulgent side of my food world, I do like to balance it out with some fruits or vegetables. I’ve noticed, for me, my body can’t handle too much full-on indulgence. Probably because 75% of the time I’m making that plant-powered salad and that’s what my body’s become accustomed to. I still want to indulge and feel good. Kerrygold reached out to me and asked me if I wanted to put together a cheese plate with their amazing, grass-fed Irish cheese. After some thought, I accepted. small eats reflects the food I put on my table, and sometimes, there’s cheese on it. I don’t believe in banning something from my table unless it’s unethical or overly processed with an ingredient list a paragraph long. Too much restriction leads to cravings and just doesn’t help in the long run. Life is about yes, not no. Alright, soapbox moment over. Back to the cheese plate. I knew I wanted to create a cheese plate with a good balance of fruits and vegetables in a fun way. Cheese plates can be on the healthier side and still taste wonderful. 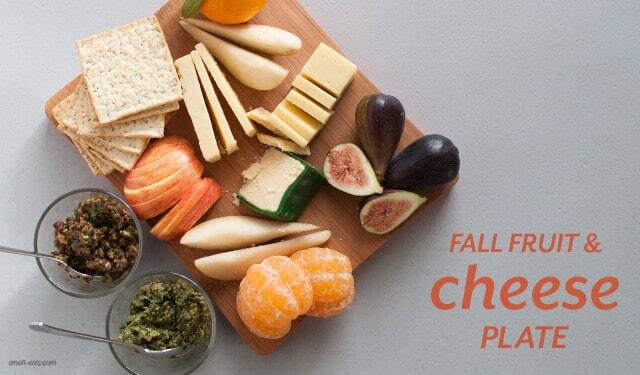 Fall brings a bounty of fruit perfect to pair with cheese. Figs, pears, apples, and satsumas have all been popping up in markets and I have been savoring their return. They all pair well with the three cheeses I put on my board: Kerrygold’s Skellig cheddar, Blarney Castle, and Dubliner with Irish Stout. Skellig is a subtle, sweet cheddar that sings with apples and pears. Blarney Castle is a soft gouda that popped with the fresh citrus of the satsuma. Dubliner with Irish Stout was quite a surprise. Flaky and nutty, it was a perfect partner for the complex fig flavors. I also made two spreads to go with these cheeses to balance out the sweetness of the fruits. As any cheese lover knows, the salty umaminess of olives is always a winner with any cheese. I created a simple and light olive tapenade that was still packed with flavor but doesn’t weigh you down. I have a feeling I will be making that for our table again very soon. The other spread is a vegan Swiss chard pesto. Basil’s not in season, but that’s no reason why we can’t make pesto with another green. The sharpness of the raw chard is an excellent counterpoint for the creaminess of these three cheeses, especially the Dubliner with Stout. I’m looking forward to putting this fruit and cheese plate together for a few holiday get-togethers, and sharing with others that a cheese plate can be a balance of indulgent and healthful. This post was sponsored by Kerrygold. I was compensated with free product (anyone want to throw a cheese party?). All thoughts and opinions are, and always will be, my own. To make Swiss chard pesto, combine all ingredients in food processor and run until everything is finely chopped. For a looser pesto, add more olive oil. Place into small serving bowl. To make olive tapenade, combine all ingredient into a clean food processor and run until olives and parsley are finally chopped. Place into small serving bowl. On a plate or cutting board, arrange all of your cut fruit, cheese, crackers, and dips.